A Garden: The Birds Arrive A Garden: The Birds Arrive is an earthwork and experimental garden at the Albuquerque Museum located in the sculpture garden right off Mountain Rd NW. This project was conceived, designed, and created by Land Arts of the American West and 7th regen, in conjunction with SeedBroadcast's exhibition "Seed: Climate Change Resilience" coming in 2019. Land Arts of the American West designed concentric planting beds radiating from a central existing pine tree and seeded these with Middle Eastern and Asian heritage grains emmer, spelt, Sonoran Wheat, and Cache Valley Rye as a winter cover crop. In the summer, local indigenous amaranth will succeed the grains. 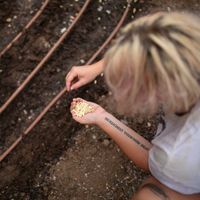 As an experiment, the garden employs two varying methods for production: dryland farming waffle gardens and drip irrigation beds. It also accommodates the shadow line of the building. A light installation will cast shadows of the growing plants on the building wall at night. The garden aims to be an area for artistic installation and future community engagement. 7th regen has created a steel portal of three half arches reminiscent of sheafs of grain and a mud stenciled phrase, "I wait for the birds to tell me when grain is ready," spoken by Tiana Baca of the Desert Oasis Teaching Garden. The name of the garden/installation - "The Birds Arrive" - was adapted from Baca's quote and the acronym TBA (to be announced). This project is about possibility, variability, and engagement. September 1, 2018 – September 29, 2019 Albuquerque Museum 2000 Mountain Rd NW Albuquerque, NM Partners and collaborators for this project include: Land Arts of the American West Rocky Mountain Seed Alliance Sarah Montgomery of Garden's Edge Christine Mackey Tiana Baca of Desert Oasis Teaching Garden Albuquerque Museum 7th regen Art & Ecology Area at UNM SeedBroadcast Sun, Wind, Rain Soil Microbes, Seeds, and Birds This project and the accompanying symposium are made possible through a partnership between Albuquerque Museum, SeedBroadcast, UNM Land Arts of the American West, and UNM Art & Ecology.